Just like so many buyer hopefuls are weighing the buy vs rent decision in their cities, the same is happening with Florida property. Have you considered buying a rental investment property in Florida? It’s a hot market, and South Florida’s sales and price stats may be signaling us to buy a rental income condo. Florida’s forecast is sunny. Economically, the Sunshine State is booming and until recently, condo construction was booming. Florida’s economy is forecast to reach $1 trillion in GDP in 2018, and new oil drilling planned here promises additional benefits for a state that has always imported its expensive energy needs. Popular Fort Lauderdale offers unusual lifestyle opportunities and spectacular condos with amenities. It’s estimated that 1,000 people are moving to Florida every day and the state will see 180,000 jobs created this year. According to the Sun-Sentinal, the highest job growth was in the South Florida counties of Miami-Dade, Broward and Orange. If Florida were a fund, it would be one of the funds with the strongest buy recommendation out there — Mark Wilson, President and CEO of the Florida Chamber. The housing market in South Florida has been oversupplied with condo units for the past couple of years but with construction stopped, that glut may be absorbed shortly. Currently, developers are eager to sell and may be willing to offer substantial price cuts. The added selection means you can pick and choose high quality units with the right features and benefits, rather than suffer bidding wars typical in other US cities. Why would you want to buy here? There’s no new construction happening. And given the strength of Florida’s economy currently and how desirable it is for retiring babyboomers, to rent or buy, the condo glut should diminish. And this will launch a new constrained housing market in South Florida with rising condo and apartment rental prices. And the advantages of buying in South Florida don’t stop there. Florida’s lack of state tax and no tax on estate transfer to children, along with the new Jobs and Tax cuts bill, make buying properties sensible. Property prices are expected to stay about the same in Miami Date County over the next year according to Zillow. Rent Cafe says apartment rental prices in Miami increased 2% last year to an average of $1632 a month. Studio apartments for 1191 per month, 1 bedrooms at 1421 per month, 2 bedroom units at 1772 and 2 bedroom apartments at 2113 a month. Home sales dropped in South Florida in January 2018, while condo sales rose. Clearly, buyers are seeing value in investing and it’s almost certain rental investors are part of it. Some are suggesting South Florida may see a boom. The condo/townhouse market in South Florida saw sales increase 7.6 percent to 3,023. The median sales price grew 7.1 percent to $180,000. Throughout Florida, sales of condos/townhouses were up 5.9 percent to 7,634 while the median sales price climbed 11.7 percent to $179,000 — from a report in Bizjournals. Contrast that to apartment rental prices in other cities including San Diego, and it looks favorable. Check out the price to rental income ratios across the US. 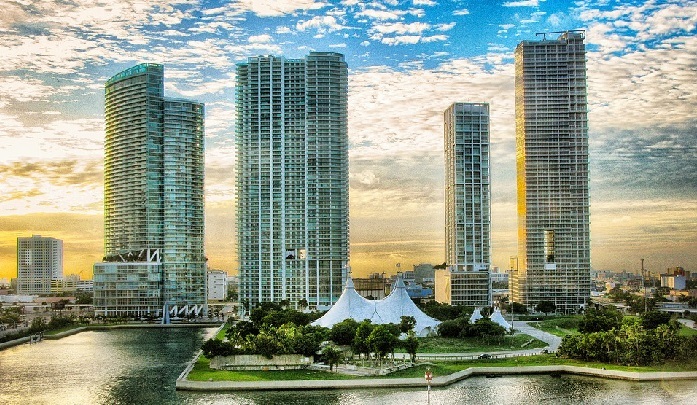 Although foreign buyers have withdrawn due to the strong US dollar, the continuing strength of the American economy, high prices in cities where babyboomers may sell their homes, and a stablized price in South Florida means investors may start buying up condos here. Bisnow reports an unsold inventory of 2300 units in December 2017 and Florida Realtors said 16,653 properties were listed in January, up 6,100 from the previous month. Months of supply was down .5% from one year ago and the number of foreclosed properties dropped about 30% YoY. Read more at Floridarealtors.org. A large portion of homes sold were from $50,000 to $199,000 and combine that with high rents typical here, and it may be a buy signal. If you’re a new resident of Florida looking for a condo, you’re sitting pretty with the high availability. If you’re an investor, you have to feel the availability and stabilizing price have to be good for you. Compare rental properties in Texas and California and you might find Florida’s prices are accessible and the outlook for rental income is positive. Find ways to increase your rental income earnings on the ManageCasa blog.